Stress is bad for you, both physically and emotionally. It can negatively affect your relationships as well as your health. Stress can lower your immune system and increase your risk of cancer, depression, chronic diseases, stroke, heart attacks, and other serious illnesses. By now, the negative effects of stress have been well-documented and are practically common knowledge. But did you know that certain types of stressful situations might be worse for you than others? 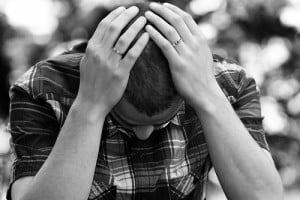 According to a recent Danish study cited by the Huffington Post, men who experience a stressful marriage may have a higher mortality rate than men who experienced other life stressors. The study surveyed 9,875 Danish men and women, asking them about the stress that they experience in their everyday lives. The study followed the participants for 11 years. Interestingly, a stressful marriage seemed to have a greater health effect than the stress of, say, one’s career or other non-marital relationships. The article reported, "Those [men] who ‘always’ or ‘often’ experienced worries and demands from partner had a higher mortality risk than those who 'seldom' had this experience ... whereas worries and demands from other family, friends and neighbors were not [associated with higher mortality]." The study didn’t explain why this is the case. Future studies may be able to answer why stressful marriages are more harmful than other types of stress and why men seem to be more affected than women. What can you take from this study? Try to keep stress to a minimum in your everyday life. It helps to exercise regularly, eat healthy foods, and avoid stressful situations (when possible). Make time to take care of yourself. In addition, the Huffington Post offers some good tips for de-stressing in just a few short minutes. If you are experiencing difficulties in your marriage that are leading to stress, consider talking to your spouse or to a marriage counselor. And if you think that divorce is the best option, call the experienced Everett, WA divorce lawyers at the Law Offices of Jason S. Newcombe.